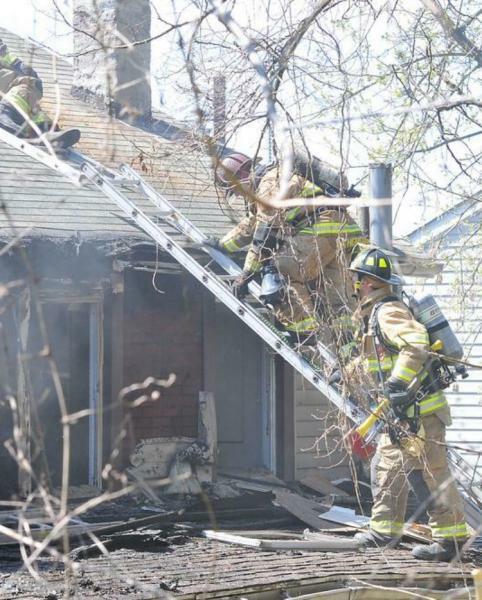 On Tuesday April 23rd, Keystone Valley Fire Department was dispatched for Ladder 8 on the Working Fire Dispatch assisting the City of Coatesville with a working dwelling fire on Coates Street. Ladder 8 responded w/4 and arrived being assigned to assist with Fire Suppression and ventilation. A two-alarm fire seriously damaged two unoccupied twin homes in the 600 block of Coates Street shortly before 10:30 Monday morning. Nobody was injured in the blaze. Coatesville Fire Chief Gary Alderman said first arriving crews had fire shooting out the third floor windows of the home at 615 Coates St. when they arrived. The home backs up to a hill and power lines in the front created access issues for ladder trucks at the scene.